Next week PSN will be hosting a Spring Fever sale with discounts on digital games. PlayStation Plus members be able to pick up several PS4, PS3 and PS Vita games on the cheap. 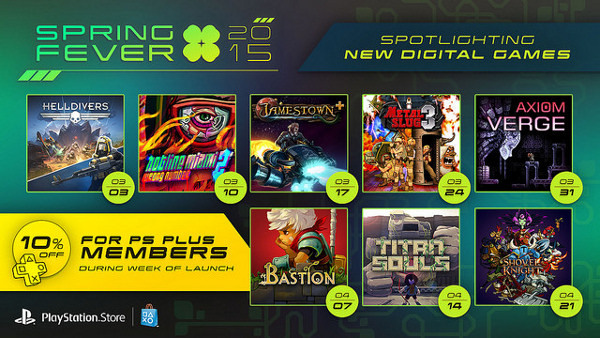 Similar to Xbox Live's Summer of Arcade promotions, Spring Fever highlights indie games. PlayStation Plus members will be able to get new launches like top-down shooter Hotline Miami 2 and space marine co-op game Helldivers at a 10% discount. A few older indies finally making their PS4 debut are part of the sale as well. If you still haven't picked up side-scroller Shovel Knight or action RPG Bastion on other platforms yet, this is your chance. The games with a single asterisk (*) are CrossBuy titles so you only need to buy it once to get it on all supported PlayStation platforms. The games with double asterisks will arrive on PlayStation Vita later but will support Cross Buy with the PS4 versions.